Prime Minister Shinzo Abe of Japan arrived in Serbia during his European tour of parts of Europe. The visit of the leader of Japan is hugely welcomed by the political elites of Serbia, who hope to foster stronger economic and political ties. It is noticeable that Serbia is the only non-European Union nation to be selected by the leader of Japan during his European tour of six nations. This in itself speaks volumes for Serbia because Japan is rightly acknowledging the strategic and political importance of this nation with regards to the Balkans. His counterpart Ana Brnabic, the Prime Minister of Serbia, on arrival, welcomed the leader of Japan. 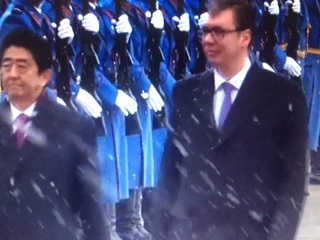 President Aleksandar Vucic of Serbia also equally awaited the leader of Japan. After all, the economy of Japan is still the third largest in the world and in recent times a new upswing is in the offing. Therefore, Serbia is hoping to cement ties that will benefit both nations to a higher degree. It is known that Abe, Brnabic, and Vucic will meet businesspeople from both nations in the hope of furthering fresh economic ties. Of great interest to Serbia are the sectors of chemicals, pharmaceuticals, and the automotive sector. Other areas of interest include agriculture, the IT sector, and boosting tourism. Another area of geopolitical importance is that the Russian Federation and Japan have strengthened ties under the leadership of Abe. Hence, with the Russian Federation having favorable relations with Serbia, then greater political understanding between all three nations will hopefully be increased. Overall, the nation of Serbia is hoping that economic and political relations will reach a new high with Japan.